The Nut & Bolt Set is our most popular add-on piece of hardware when purchasing street signs & posts. 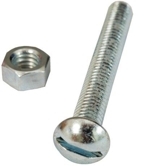 Set is sold as 1 bolt with 1 nut. Two sets are typically required to mount one sign. Slotted 5/16" -18 thread x 2-1/2" Nut & Bolt Sets are the ideal choice for all your sign mounting projects. Bolts are a great choice for use with our Vandal Resistant Break Away Nuts. Buy with your order of signs and save yourself a trip to the hardware store!